Our players Víctor Pastor, Costi Peruzzi and Andrea Gobbato were among the top fifteen in the Seville Championship, organized by the Royal Andalusian Golf Federation, which took place last weekend, the 18th and 19th of February at the Royal Golf Club Pineda.The championship was played in medal play scratch mode, 36 holes. The UGPM players participating in this tournament were: Víctor Pastor, Costi Peruzzi, Andrea Gobbato, Elias Azzam, Ryan Henn and Manu Geiger.Victor finished with +4, reaching -2 the first day and +6 the second. Costi scored a total of +9, finishing with +4 on the first day and +5 on the second. Andrea got a final score of + 8, getting +6 and +2 during the two days of play. After a break from our competitions’ calendar due to the Christmas holidays and the recently finished exams period, our players return from Seville with the aim of strengthening and improving everything they can during this second semester, with their focus put on working more intensely in the respective technical , psychological and physical parts which have not allowed them this weekend to get better results within their ambitious, strict and self-demanding sports goals. 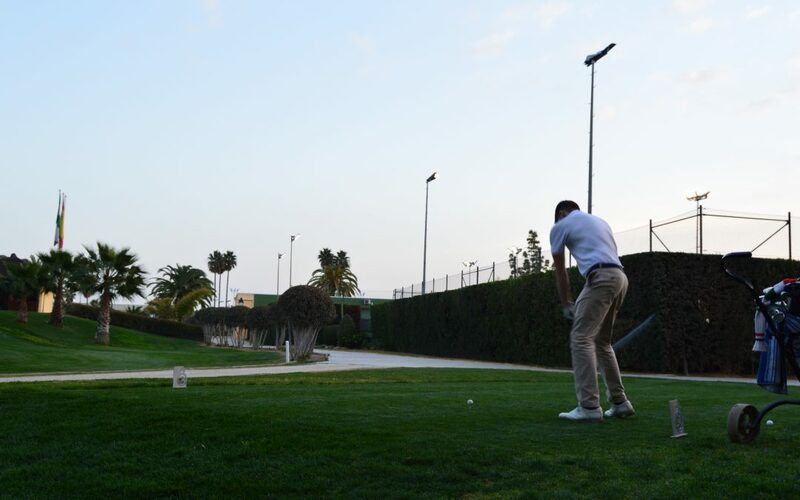 Nevertheless, the overall feeling of the team during the stay in Seville reflected a good mood during both days and on the golf course. We enjoyed an unbeatable good weather and our players enjoyed many good moments, both during the championship and during the sightseeing of Seville’s city centre. We will now review the overall performance of this competition together and evaluate the personal development of each UGPM player during his game with the entire team. Without of a doubt they will improve for the next tournament, as they have shown so many times before.